Another round of great rebates and cash offers is out from our favorite smartphone app; Checkout 51 !! Must buy one CLEAN & CLEAR® ADVANTAGE® Acne Control Kit. Any variety. Excludes canned oranges. 8 oz or larger, any variety. Any variety. Items must appear on the same receipt. Must buy one AVEENO Baby product. Excludes trial sizes. Any variety. Excludes Glade® Automatic Spray Refills and Glade® Sense & Spray®. Any aerosol. Items must appear on the same receipt. Any variety. Excludes value packs. Any variety. Excludes Glade® Wax Melt Warmer. Submit a grocery receipt over $60 and you could win $500! There is a new, free coupon source available called Checkout 51 that can be used in conjunction with paper coupons and other digital coupon programs! You can use it with your smartphone or computer. * Sign up on the Checkout 51 website for free using your e-mail or Facebook info. * Browse the available offers (and print out a list if you don't think you will remember them). * Head to ANY store and buy the offers you want (like $1 cash back on ANY gallon of milk or .50 cash back on blueberries or ..75 cash back on peoples magazine.). * Take a photo of your receipt and upload it to Checkout 51. * Once they confirm your purchase, they will credit your account. I received our credit for the 3 receipts we submitted within 12 hours! * Once you collect $20 in your Checkout 51 account, you can cash it out in the form of a check mailed to your desired address. *Checkout 51 is not store specific. You can buy the items at any store, which is a huge bonus. * New deals come out each Thursday and are available until the next Wednesday. You have to buy the participating product and submit the receipt during that week to get credit. Not everyone gets the same offers so make sure you log into your account to see what offers you received. * There are a limited number of redemptions per item so make sure you submit the receipt as soon as possible so you can get the offer. * You will be allowed to get cash back once for each offer. 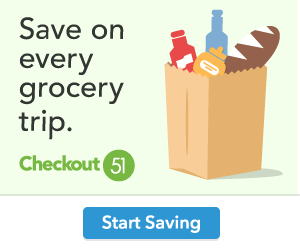 * You CAN use Checkout 51 offers with paper coupons and other digital coupon sites like SavingStar,com & ibotta !